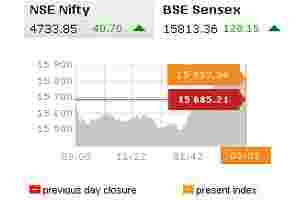 New Delhi: Shares erased early losses and rose for a second day on Thursday, with sentiment helped by gains in European markets though investors were cautious because of domestic economic concerns and government policy inaction. The main 30-share BSE index closed up 0.82%, or 128.15 points at 15,813.36, with 22 of its components rising, after dropping 1.35% at one stage. “I think Europe was the only positive factor today," said R.K. Gupta, managing director at Taurus Asset Management in New Delhi. “Otherwise, not much fresh buying coming at this point. People expect more downside." Telecom carriers Bharti Airtel fell 1.8% and Idea Cellular shed 1.3% after a source said the government had decided to not allow pacts between companies to offer 3G services beyond their licensed zones through roaming agreements. The benchmark index had snapped a 5-day slide and rebounded 3.4% on Wednesday, but the outlook remains clouded by slowing growth and foreign fund outflows. The index is down nearly 23% on the year. Foreign institutional investors have been net sellers for eight straight sessions to Tuesday, data from India’s capital markets regulator showed. The funds have been net sellers of more than $500 million worth local stocks so far in 2011, a far cry from record net inflows of more than $29 billion in 2010. Gupta said the market was oversold and there could be a bounce back as funds try to prop their books before the year closes. The 14-day relative strength index (RSI) of the main index had slumped to 31 at Tuesday’s close. A reading below 30 typically indicates oversold conditions. At Thursday’s close, it was at 44.6. Software services exporters including Infosys Ltd and Tata Consultancy Services fell after dismal results from Oracle Corp, the world’s No.3 software maker, stoked fears of a slowdown in global technology spending. Infosys closed 0.8% lower, while Tata consultancy fell 0.6% and Wipro shed 2.4%. The stocks have outperformed the broader market in the current quarter, helped by the rupee’s sharp fall against the dollar. The companies get most of their revenue from the United States and Europe, but bulk of their spending is in the Indian currency. “Currency is in the stock price already, but what is not there in the price is the slowdown," said Ambareesh Baliga, chief operating officer at Way2Wealth Securities. Energy major Reliance Industries, India’s most-valuable firm, reversed early losses and closed 0.9% higher. The company said it bought a minority stake in Terra Power, a US-based nuclear-technology design and engineering company. The 50-share NSE index rose 0.87% to 4,733.85. In the broader market, gainers led losers 864 to 576 on total volume of about 573 million shares. World stocks as measured by MSCI were up 0.21%, while the emerging equities were little changed. • GVK Power and Infrastructure closed 2.9% higher. The company is looking to sell a minority holding in its Australian unit, GVK Hancock, to raise up to $500 million, sources told Reuters. • Thinksoft Global Services Ltd rose 11.5% after the company said it signed a Rs50 million contract with the Reserve Bank of India.